The Extravaganza Scala Fair on the 13th and 14th of March has had a record turn-out of visitors. The Extravaganza themed Scala Fair drew visitors from all over the world to the Scala Playhouse showroom in Almere, The Netherlands. The record-number of visitors were treated to an extravagant fair with beautiful decorations and various events. One of the highlights of the fair was one again the famous Cash & Carry, which went so fast and furiously that Scala Playhouse already had to restock it with new items on the Sunday afternoon. Visitors were able to profit from many deals from the biggest brands like CalExotics, Pipedream and Doc Johnson. During the Extravaganza Scala Fair, many new products and collections were introduced. One of the highlights was the successful introduction of its new brand Get Real by TOYJOY. Other new introductions that were received very positively were the new Hylo & Enya trusting vibes in the Caresse by TOYJOY Collection and the Xeno prostate massager by TOYJOY Designer Edition. Besides presenting its own, in-house brands, Scala Playhouse also took the chance to introduce visitors to new brands in its assortment such as Fantasy Lingerie and Wicked Sensual Care. The new Inspire range by CalExotics – exclusively available at Scala Playhouse – also received a lot of attention, gathering praise as a revolutionary range of sexual aids that is expected to sell really well. Guests were treated to freshly brewed coffee, scrumptious popcorn and sweet cotton candy for to feast on. Scala Playhouse also provided some eye candy, as there were beautiful male and female lingerie models that used the showroom as one big catwalk. The female models dazzled visitors in Baci, Allure and Fantasy Lingerie. The male model wore Envy by Baci. Guests could join in on the special TOYJOY Raffle; winning 300 euros worth of TOYJOY products. That wasn’t the only prize-competition though: visitors could also use the Lucky Crane to grab themselves an amazing prize. Besides deals, new product releases and prize-competitions, the Scala Fair also provided lots of useful information and inspiration to visitors. Guests could attend the Scala’s Academy Live, which featured a new walk-in concept. This meant that at certain times during the day visitors could attend a mini-workshop by some of their favorite brands at the actual showroom booths. Attendees were thrilled with the useful tips & tricks they received on maximizing their sales potential. Of course a Scala Fair wouldn’t be a Scala Fair without an amazing Scala Party to match. Therefore on Sunday evening guests were treated to some drinks and snacks, plus lots of musical entertainment in the Scala Playhouse showroom restaurant. A piano man, guitarist, beatboxer and a DJ got visitors grooving along until the early hours of the morning. 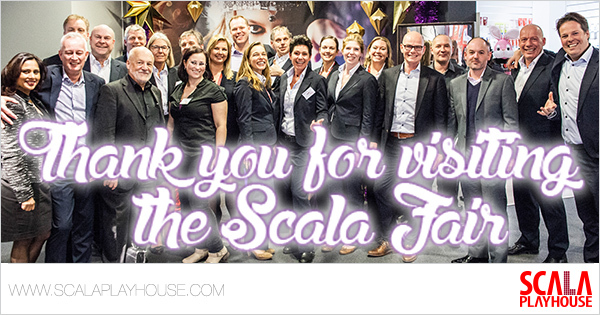 Scala Playhouse is thrilled with the success of the Extravaganza Scala Fair and wants to thank all its visitors and suppliers for their valued attendance and continued support and trust.